A dyslipidemia diet is a diet aimed at dealing with dyslipidemia before it does too much damage to your body. But what is dyslipidemia? The medical dyslipidemia definition states that it is an excessive amount of lipids in the blood, which includes having high bad cholesterol (also known as low density lipoprotein; LDL) and triglycerides (a type of fat). Those with dyslipidemia run the risk of health issues like plaque buildup in the arteries, which in turn, increases the risk of heart attacks, strokes, and other heart events. That being said, the purpose of a dyslipidemia diet is to help reduce the health risks of the condition. We are going to take a look at a dyslipidemia diet, covering foods that you should be eating, food that you should be avoiding, and the guidelines that cover a good diet of this nature. Following any diet can be tricky, but a lot of the dyslipidemia diet suggestions are fairly easy to add to the diet and fairly easy to follow. The following are types of foods that are recommended. Foods that are rich in fiber are great for this type of diet because of how they chemically react with cholesterol in the body. Fiber will bond with the bad cholesterol while in the intestines. This allows the cholesterol to pass through your system rather than enter the bloodstream. Fruits like bananas, apples, pears, prunes, and avocado are highly recommended, as are vegetables like artichokes, peas, okra, squash, and Brussels sprouts. There are a number of beans and legumes that are high in fiber, and you can easily add them to your diet. Try black beans, chickpeas, lima beans, and lentils. Seeds like flax seed and quinoa are also good sources of fiber. 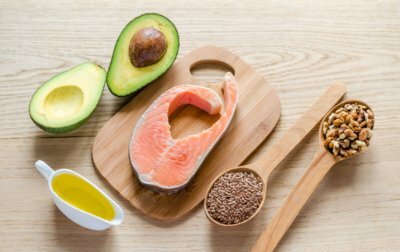 Healthy fats (or polyunsaturated fats) like omega-3s and omega-6s can help you by reducing your cholesterol and triglyceride levels. Foods that contain large amounts of these healthy fats include fish like salmon, tuna, mackerel and trout, as well as olive oil and canola oil and avocados. Sterol is a substance found in all plants that can help you with a dyslipidemia diet. It works much like fiber, as it grabs cholesterol in the intestines and helps it pass through the body as opposed to going into the bloodstream. While most foods don’t have enough sterol naturally, you can buy foods that are fortified with sterols like margarine, yogurt, salad dressings, juices, and milk. But, while there are numerous foods that are fortified with sterol, you should make sure to read the label and watch your calories. Along with the foods that you should be adding to your diet, there are a few dyslipidemia diet guidelines that can also help your battle against dyslipidemia. Saturated fats are a prime contributor to bad cholesterol, so reducing a number of saturated fats is important. Avoid foods like butter, fatty meats like bacon and sausage, cheese, and junk food like donuts. Alcohol tends to have higher levels of serum triglycerides and excessive alcohol intake can end up exacerbating dyslipidemia. Doctors will recommend cutting your alcohol intake and even avoiding alcohol altogether for this diet. Smoking is bad for you in general, but what you may not know is that cigarettes contain low LDL cholesterol levels. Quitting smoking eliminates just one more factor that can affect your dyslipidemia. Briefly mentioned in our general guidelines, reducing your choleric intake can help reduce the amount of bad cholesterol going into the body. As a side bonus, it’s also just a good thing in general for your health. Probably the hardest of the part of the dyslipidemia guidelines is losing weight. Being overweight tends to make the body increase production of very low-density lipoproteins. Keeping an eye on your calorie intake as well as losing weight will cause the body to stop making that LDL which is an important step when dealing with dyslipidemia. While the dietary steps we mention are relatively easy to add to your diet, some of the guidelines are a little tougher. No matter how easy it may seem on paper, weight loss for a lot of people can be a bit of a struggle. The motivator, though, is dyslipidemia treatment. Because without taking any of these steps, a person with dyslipidemia is looking at some serious health issues, and no one wants that. Cooper, K., “Guidelines for a Dyslipidemia Diet,” Livestrong, February 18, 2014; http://www.livestrong.com/article/425652-guidelines-for-a-dyslipidemia-diet/, last accessed August 4, 2017. “Managing your dyslipidemia with TLC: Therapeutic Lifestyle Changes,” The Journal of the American Osteopathic Association, April 2010; http://jaoa.org/article.aspx?articleid=2093954, last accessed August 4, 2017. Morgan Griffin, R., “The New Low-Cholesterol Diet: Plant Sterols and Stanols,” WebMD, February 2009; http://www.webmd.com/cholesterol-management/features/low-cholesterol-diet-plant-sterols-stanols#1, last accessed August 4, 2017.